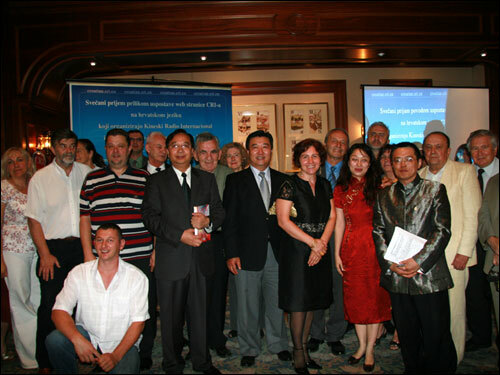 At the opening ceremony in Zagreb, 2nd July 2008, launching croatian.cri.cn. 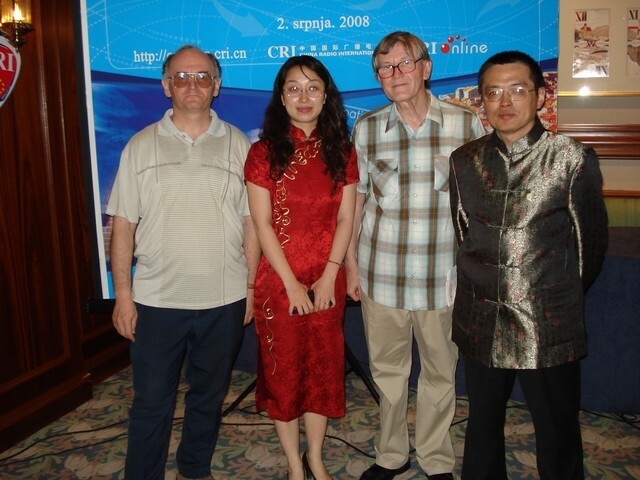 China Radio International (CRI) was founded in 1941. Since 1998 it is also active via WWW, and now has as many as 53 web sites in various national languages, including Croatian. 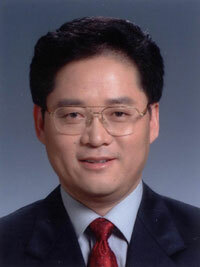 Mr. Wang Gengnian, president of the China Radio International. Below is his address to the visitors of croatian.cri.cn written, of course, in Croatian language. Dobro došli na hrvatsku web-stranicu Kineskog Radio Internacionala! Srdačno vas pozdravljamo iz Pekinga! Kineska stara izreka kaže da "Međusobnim upoznavanjem, bez obzira na daleko ili blizu, i najveća udaljenost može postati susjedstvo." Iako su Hrvatska i Kina geografski udaljene jedna od druge, narodi dviju zemalja njeguju duboko međusobno prijateljstvo te neprekidno jača suradnja dviju strana. Radi još boljeg razumijevanja i suradnje, Kineski Radio Internacional je uspostavio web-stranicu na hrvatskom jeziku. Naša web-stranica će vam detaljno i točno predstavljati kinesku kulturu, razvoj društva, suradnju i međusobne kontakte između Hrvatske i Kine na svim područjima. Kina više nije "daleka", već zemlja pred vašim očima! Srdačno vas pozivamo da posjetite hrvatsku web-stranicu Kineskog Radio Internacionala! A detail from the opening ceremony in Sheraton hotel in Zagreb, Croatia. 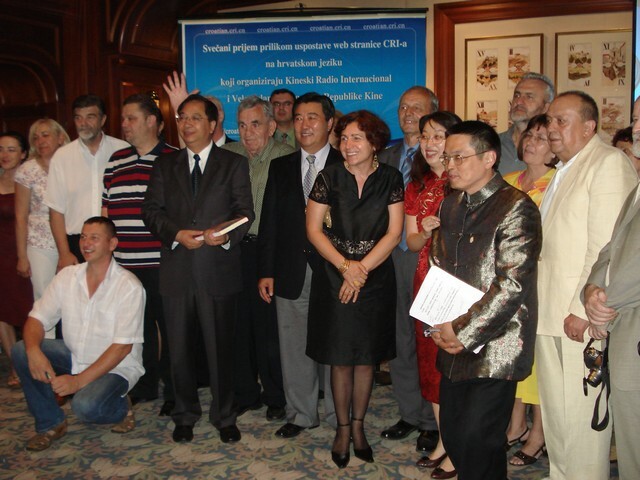 The web page croatian.cri.cn covers bilateral relations between Croatia and China, and provides information about China, Chinese culture, sport, music, toursim. There is also a tutorial written in Croatian for learning Chinese language. I recommend you a section Music Online, devoted to Chinese folk music and classical instruments. Of course, there is plenty of information about forthcoming Olympic Games. H.E. 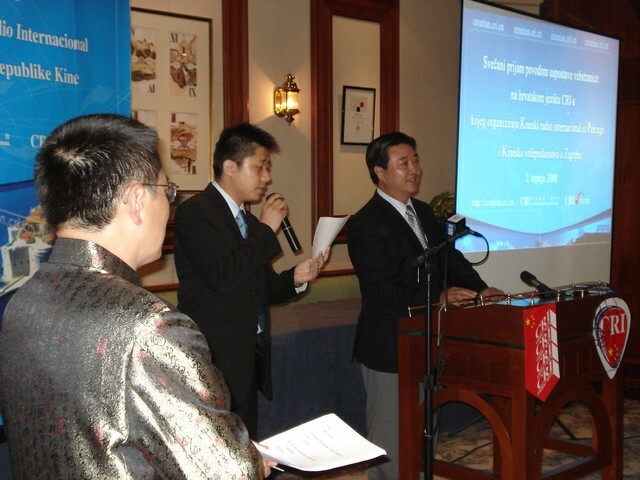 Mr. Wu Lianqi, ambassador of P.R. 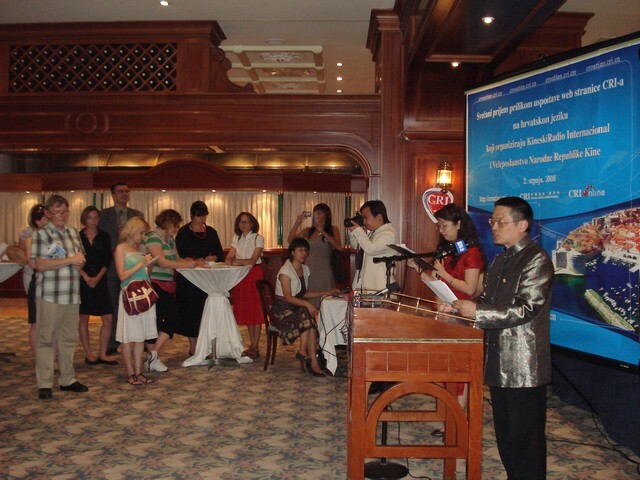 of China in the Republic of Croatia, in his address on the occasion of opening the first Chinese web site in Croatian language. 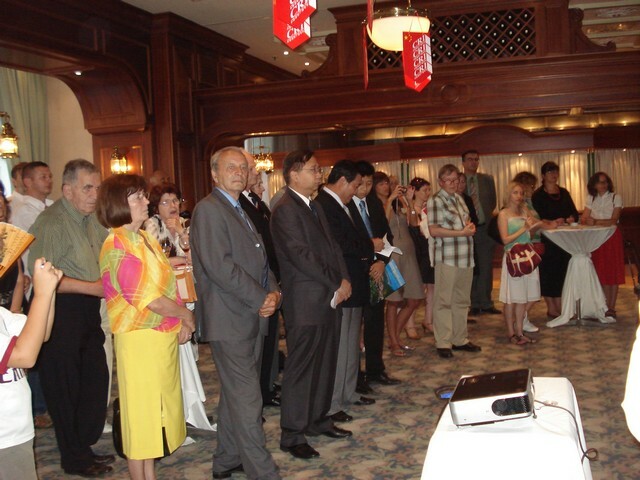 Distinguished guests in the audience, including the personnel of the Embassy of the P.R. of China. 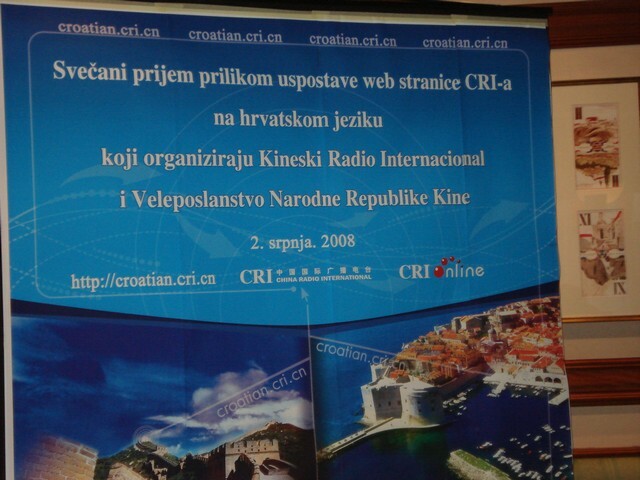 The web site croatian.cri.cn is born! 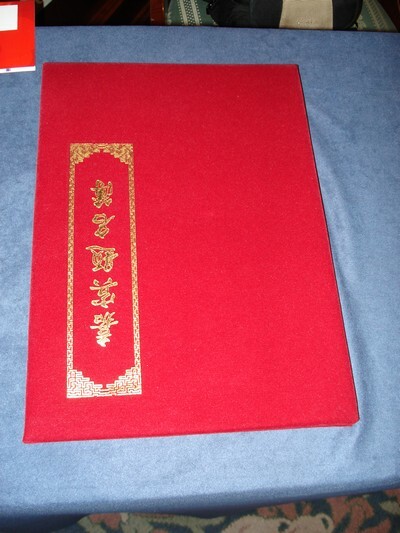 It is the first one in China published in Croatian language. 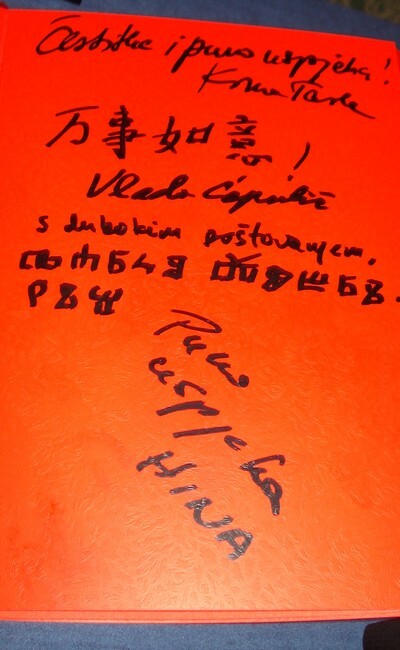 A page from the Guest Book with a few signatures: Professor Vlado Ćepulić signed himself in Chinese, while the auther of these lines signed in Croatian Glagolitic Script. The ceremony in Zagreb was a nice occasion for friendly contacts and discussions. 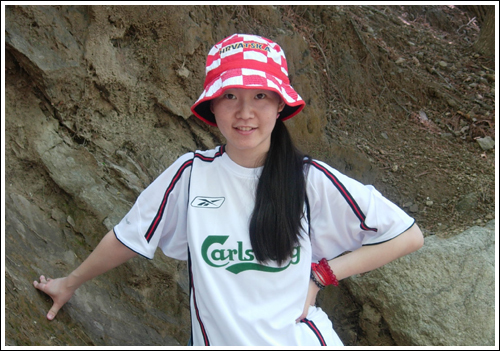 Mrs. Qu Huibin speaks Croatian, and likes the town of Opatija very much. Her Croatian name is Helena. She is employed at croatian.cri.cn on questions regarding economy. 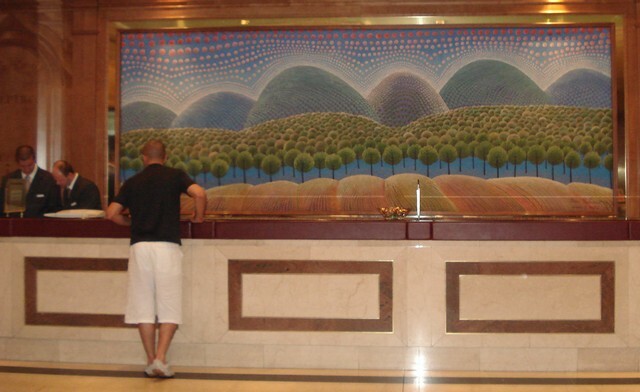 The opening ceremony was held in the Sheraton hotel in Zagreb, which has the reception desk decorated with fantastic work of art by Ivan Rabuzin. Please, go to the next page below.